I store my chain necklaces in this see through holder. I can hang one or two chains on each knob. Love it so much I bought one for my mom for Christmas. You can see each chain thru the clear acrylic. Love the inside bottom piece because if a chain falls off, it is easily retrieved. This is so great for my nicer necklaces. Keeps them from getting tangled and dusty. Easy to take them in and out. Great item at a reasonable price. This necklace holder is the perfect height for all my chains. I bought one a few years ago and love that this new one has an extra inch of height. Perfect way to store necklaces as you can see them thru walls of holder. This is the best way to organize necklaces. I got one for both of my teenage daughters. It saves the necklaces from being tangled. You can look through the acrylic container and see everything. It can hold a lot of necklaces by hanging several or more of the fairly long hooks. Love it! Love that I can see my necklaces. Finally a product that does what it promised. Second one I've purchased. Perfect for all necklaces. I keep my pearls in one and gold chains in the other. Your jewlry is on display .You can see your jewlry at a glance & put your outfit together easily. Bought a second one & use one for goldtone & the other for Silvertone. I now have four of these necklace holders and just love them! It's easy to see which necklace you're looking for - and maybe even a few you've forgotten about. It's easy to retrive and return the necklaces; best of all, while they remain on display the also remain completely dust-free! Wonderful product. The acrylic cover is not really needed. I use mine without it. I have two and it hold all of my necklaces nicely. Best way to store my necklaces! I have four of these! I use one for gold and one for silver small necklaces, then one for colored necklaces, and the last one for my more exotic large necklaces. They really keep me and them, straight! Finally a way to keep my necklaces tangle free and protected. Excellent way to hang all those fine gold and silver chains of different lengths - prevents tangles & knots. Easy to see and retrieve the necklace you want. Enough pegs and space to hang all the same length of chains on one peg. Easy access. Great product! This is a great item, keeps my necklaces untangled and easy to access. I just love my display organizer! I can readily see my necklaces to choose which one I want and easily pullup the top and retrieve it. I'm afraid I have so many necklaces I had to buy 2, so I can see them all! I ordered one then another to separate gold and silver jewelry. Now It's SO easy to find what I want to wear. I purchased this necklace holder years ago for myself.. I purchased this necklace holder years ago. It is attractive and I can spot the necklace I need at a glance..The perfect gift for a fashionable lady. I have purchased several for my daughters and nieces. I love this Holder would buy another one and one that will hold longer necklaces twice as tall as this one. Love it - I have two now. I already have two of these necklace holders and have returned to buy one more. I've never found another jewelry holder that keeps my necklaces untangled and easy to find. This is one of the best products I've bought. Gave one to my daughter also and she totally loves it. Easily displays my necklaces,keeps them dust free and untangled and takes up,very little space. great prodcut, clear design lets you see your necklaces so they are easy to find. I like being able to see what I have. The different lengths of necklaces are easy to pick out now. Gave it to a granddaughter. she likes putting her necklaces in it, they don't tangle now. Such a great iten that I also purchased some as gifts. This item is great. I have purchased two, and use one for my yellow gold necklaces and the other one for my white gold jewelry. It keeps the jewelry neat and organized and makes it easy to choose which necklace to wear. This product keeps all my necklaces tangle free. Never have to spend time separating chains. They are all on display so you can easily pick what you want. I like the idea that my necklaces won't get dusty and they are easily available for me to see. I only wish the unit were a little higher and wider. Overall, it's a lot better than nothing or having them lie around in a box. I like it alot. Looks good on my dresser. Keeps my necklaces organized. Yes,it would be cool if it spun because it looks like it should. I will definately get another one when I fill this one up. It does hold a good amount but not as many as Id like. Use this daily in our Holiday shop it just sparkles. I've used one of these for years. My chains are visible, yet dust-free and tangle-free. I'm ordering a second one so that silver and gold can be separated. Organizing my many chain necklaces. Only wish there was one accommodated even more necklaces in one unit. I use it to store necklaces. It's clear color fits in anywhere. I love this product. Its fantastic! This necklace holder is great, keeps your necklaces in full view, so you can see what you have at a glance. It holds a lot of necklaces. I love my necklace holder. It looks very nice on my dresser. Keeps my necklaces organized and tangle free. I am here on the website now to buy a 2nd one. Sets on dresser great.easier to find items used more often. At last I have a way to store my necklaces without getting them all tangled up. I love that they are displayed where I can make a nice selecton too. Excellent for keeping jewelry free of dust. Looks nice on my dresser too. great storage and will keep things organized!! I own Six of these! I consider jewelry an important part of every outfit. Whenever I am in public, I am wearing a necklace and earrings that match my clothing. The only way I can accomplish this is by having all my jewelry organized by color and easy to locate. This necklace holder makes it easy to find the best match. Over the years, I have acquired many lovely necklaces - but too often I forget that I have them so they never get worn. By using the acrylic necklace display, I can see at a glance what I have and can easily select the one that goes perfectly with my outfit - and remember to use one that I normally would have forgotten. I owned this product in 1993 and was looking for a replacement; and WOW, am I glad to find Miles Kimball has it, exactly what I want. This really works; keeps your necklaces tangle free, and neat, and readily accessible. I highly recommend this necklace holder!!!! 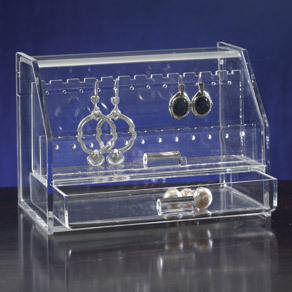 It is attractive and doesn't take up much space but holds a LOT of necklaces, and keeps them organized. I make and sell jewelry, this is a great display for my pieces. I love this for displaying and holding my necklaces. I love not having to sort thru multiple chains for the one I'm looking for. They hang free and don't get tangled. Great to have necklaces so you can see them. Great item! I ordered one and my stepmom saw it so I ordered her one for her birthday. She loved it! Everybody needs one. Great product, would buy a second. Doesn't travel well. Broken when I received it. The bottom was broken off the middle spindle. Also one of the little necklace hangers was broken off. My mom loves her necklace organizer. This keeps her necklaces from getting tangled together. This was given as a gift and fit just what the receiver had desired. [...] I had one of these at one time which is why I sent one to my granddaughter--she wanted a way to keep her necklaces from tangling. I found it inconvenient to lift the top to get what I wanted but other than that, it was fine. A side opening would be easier to use. The case is helpful in keeping necklaces from tangling with each other,but a side opening would be preferable rather than having to lift the entire case to reach a necklace. Gave as a gift, and for myself. Ok, but hard to get necklaces because the onside doesn't spin. I believe the necklace holder would be even nicer if it were available in color. The item arrived broken. The lid is too flimsy. Not worth sending back, it would cost close to what I paid. Disappointed. I had been looking for something like this for my necklaces to hang and be easily seen. Have 3 already and love that necklaces don't get tangled! 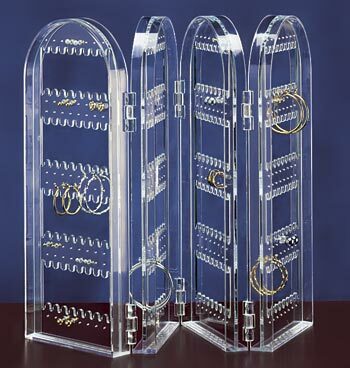 I have purchased 2 other of these jewelry holders. Love it!!! I have one already and needed to get another one. I need to hang my necklaces to keep from tangling. I already had one of these and loved it. As I accumulated more necklaces, I figured it was time for another. Still happy. I'm giving this to my daughter, as I have one and I love it! "Jewelry is easy to find and untangled when choosing your selection." a lot of fjewelry - will be nice to keep some of the chains straight... no kinks or knots..
Want to hang necklaces as well as keep them dust free. Daughter wants to get rid of Disney jewelry holder - too grown up for that little girl stuff- this is a nice replacement to her princess jewelry holder. I had one very similar to this years ago. Need a way to hang necklaces. It was my wife's choice and I am buying it for one of her Christmas presents. I have lots of Necklaces and and them Enclose so no one can easy get to them is ideal for me. I should have ordered two. This looks like a good solution to my necklaces getting tangled. Looked on line and have not seen anything like it. Reviews indicated it is very good for keeping necklaces from tangling. We have ordered this in the past and my wife loves them. Really helps to keep her necklaces in order and displays them nicely. Can see all my necklaces. I already have a few of these, and they're very efficient and attractive. My jewelry collection has grown. 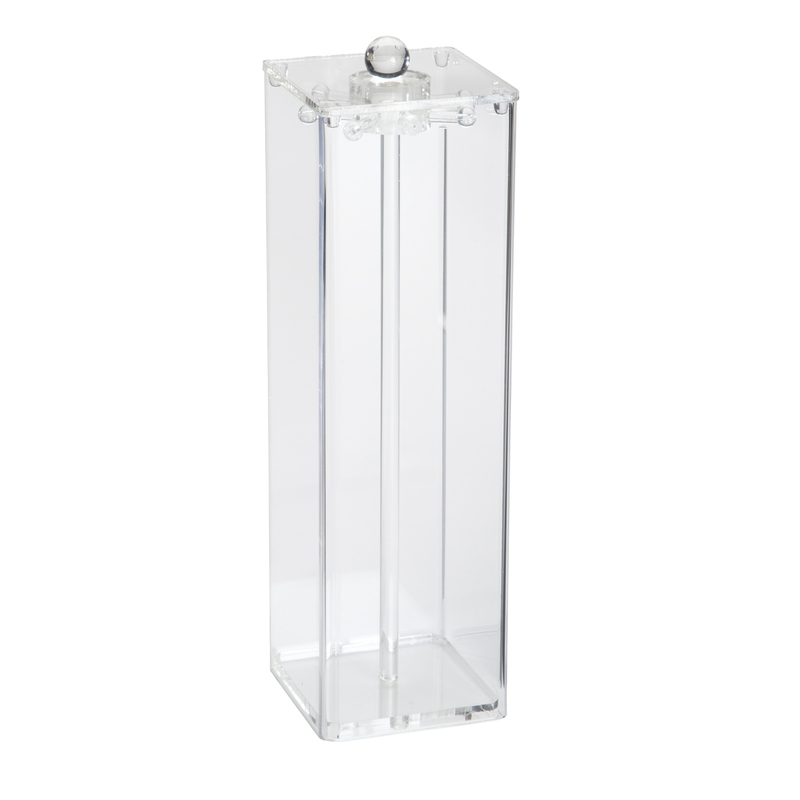 I have one already and love it because I can store many necklaces in a small space and they are tangle free. I have one and love it. Sent another to my sister. I already have one and really like it. It keeps my necklaces tangle free. Owned it before and moved from GA to WA and gave them away. My favorite way to hang neclaces. HAVE A LOT OF NECKLACES AND THEY GET TANGLED-HAVE BEEN LOOKING FOR SOMETHING LIKE THIS. I have 2 and love how they keep my necklaces in plain sight so I can select the right one for the day. It also keeps them nice and untangled. 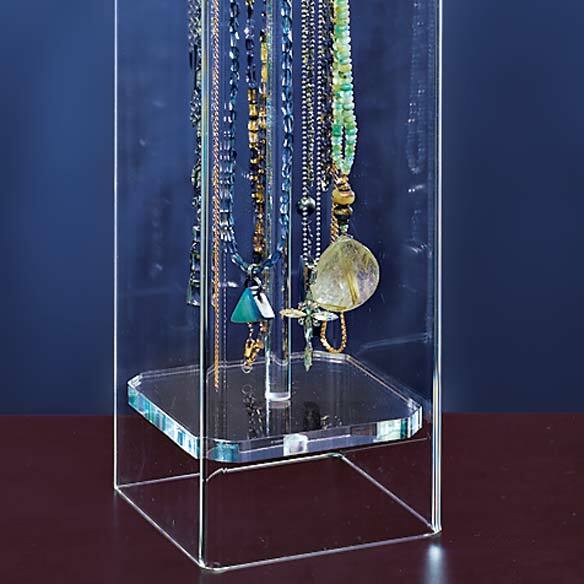 Handsome jewelry display/storage unit at an attractive price. I need more storage for my jewelry. At only 13" high, how will this work when all necklaces are longer than that? BEST ANSWER: Clasp the necklace, take the necklace at both ends, turn the ends in the opposite direction (one end forward and one end backwards making like an eight) fold the two ends together and loop the two ends on one of the holders. this makes your necklace half of it's original length and hangs well within the holder....if the form does not hold like it slips use a small paper clip to hold the form. Wow! You are clever!! Thanks so much! I drape across more than 1 hook when the chains are too long. This is a great product... The tallest one i could find too. Keeps dust off jewelry and is very sturdy! I plan on buying another one bc i think they are great! The question is very valid. My longer necklaces do bunch over at the bottom of the holder and do add weight to the rod when I pull it out. Unfortunately, I've not yet found another product that would hold my necklaces. When you hang a necklace it is only half its total length. Thus, a 26 inch necklace will be just 13 inches and will hang just fine. Anything longer will just bunch at the bottom of the holder. Oh my gosh, I didn't think this through!!! Thank you so much!! That makes good sense!! Thanks for taking the time to answer, appreciate it. The necklaces pool at the bottom of the bar. Only once a thin necklace got stuck, but it was loosened easily. Thanks. I have ordered it, and will give it a try. how many necklaces does it hold? BEST ANSWER: I have a lot on mine. It really can hold LOTS of necklaces. I even have some beads on mine. It would depend on how many you want to put on each spoke. I love mine. I have two. In reality It could hold as many as you could squeeze in, but in order to keep them from tangling, I have twelve hanging on it.